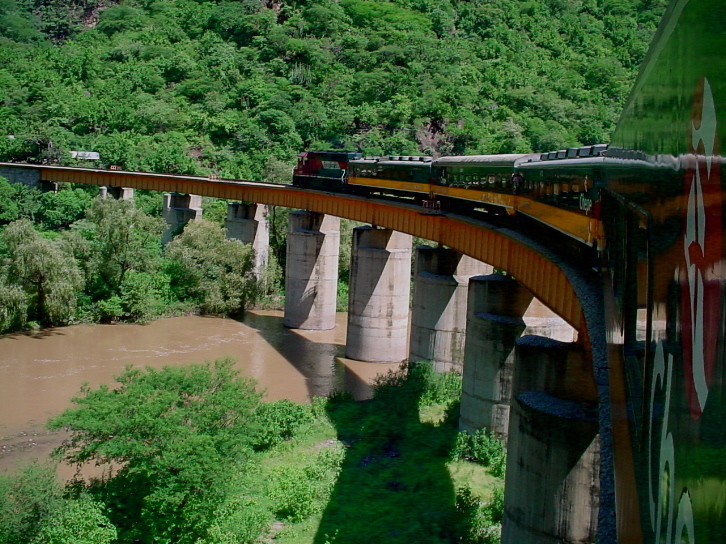 One of the most impressive engineering feats ever accomplished in Mexico can be seen in the magnificent scenery of Copper Canyon - the Chihuahua-Pacific Railroad. It was inaugurated on November 24, 1961, with the aim of promoting the development of the Sierra Tarahumara and providing Chihuahua with a route to the sea thorough the state of Sinaloa. The route begins in Ojinaga, passes through the city of Chihuahua, crosses the Sierra Tarahumara, and descends [westward] to the Sinaloa coast, via Los Mochis, winding up in Topolobampo. The total length is 941 Kilometers, and there are 410 bridges in all. The longest bridge spans the Fuerte River (500 meters), and the highest one arches across the Chinipas River (90 meters). 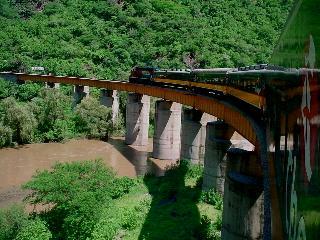 The rail line passes through 99 tunnels, with a total length of 21.2 kilometers; the longest one, 1.81 kilometers, is located at the border between the states of Chihuahua and Sinaloa. At its maximum height, the train reaches an elevation of 2,450 meters above sea level. The railroad crosses one of the sheerest regions of the mountain range and runs through the entire Septentrion Canyon, as well as certain portions of Urique Canyon. Construction of this line began in 1898, and tracks were laid in Creel in 1907. Work on the railroad was interrupted by the Mexican Revolution, but was reinitiated in the 1950's and finally finished in 1961. 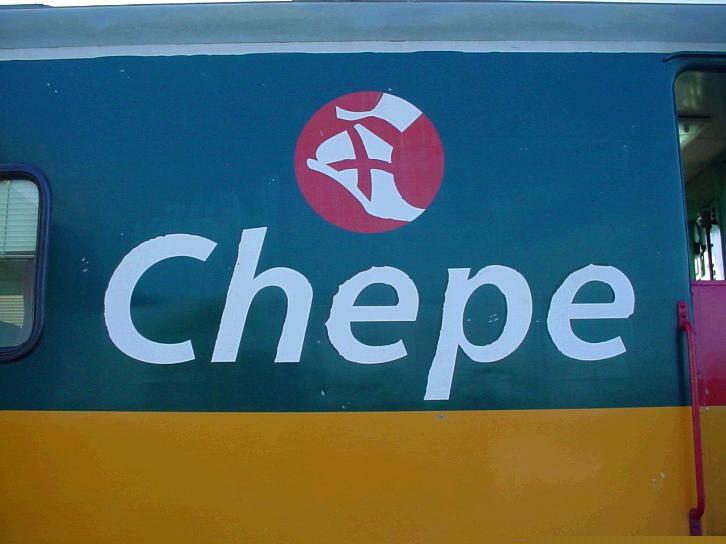 The most attractive places where the train stops are Creel, Divisadero, San Rafael, Cuiteco, Bahuichivo (Cerocahui), Temoris (Chinipas) and El Fuerte (Sinaloa). 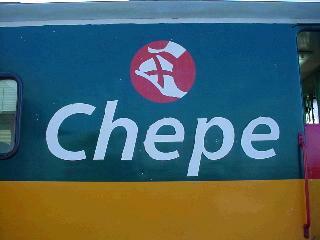 It leaves every day from Chihuahua to Los Mochis and from Los Mochis to Chihuahua at 6 a.m. and arrives about 10:00 p.m. It stops only at the tourist destinations of Cuauhtemoc, Creel, Divisardero (a 15 minute stop to admire the Copper Canyon), Posada Barrancas, Bahuichivo/Cerocahui, Temoris, El Fuerte and Los Mochis. The train features a Dining Car, a Smoking Bar Car and runs with 2 to 4, 68 passenger cars. fully carpeted a/c and heaters, reclining seats and restrooms for men and women. The Dining Car opens from 7:30 a.m. to 8:00 p.m. serving breakfast, lunch and dinner with menu a la carte. No food and beverages are allowed in the passenger cars. Bar is open from 10:00 a.m.. serving different cocktails and liquors. Cards and domino games available. Both trains operate with an ecological disposal of water. The running water doesn't flush to the ground, but it is taken to special sewage in Chihuahua or Los Mochis. In every car a helpful Porter travels helping passengers with their luggage and to assign seats. From March to the end of June everything is very dry and you might find some mountain fires. Rainy season is between June and late October. 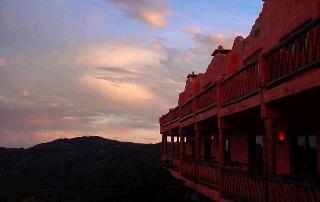 It is the best season for traveling because the landscapes have brighter colors. From November through February the temperatures are low and you might have some snow. [We found early September to be excellent, the end of the rainy season with water falls and rivers fully flowing]. Be sure to take goggles or wrap around sunglasses if you plan to photograph from the open vestibules at the end of each car because of the dust that the train kicks up. Use a digital camera or quick advance 35 mm camera because at the Termoris Switch backs, there is so much to shoot that you will need to 'fire at will' and delete bad shots later. Take extra memory cards and batteries. You can recharge camera batteries only in the bar car's one outlet, and of course in the hotels with standard American plugs. Extra memory cards are a must so that you can swap in an empty card even in the middle off the Termoris Switch backs. I took a laptop and downloaded and formatted the memory sticks (4) each night. Remember that the best shots of scenery are from the vestibules where the tops of the doors are left open. With 2 of these doors on each end of each car, that makes four close together where cars are attached in case someone else is in the other spots. The train is only 4 or 5 cars so you can change your position if it gets too crowded in one area. Get yourself a Chepe listing of scenic spots along the track (such as longest bridge, highest bridge, 360 degree turn, etc.) which are listed by Kilometer Marker along the way so you will not miss the best shots. Take bottled water for your time in the coach seats or purchase water in the diner and bar car. Soft drinks in large glass bottles (355ml) are $2 Drinks were cold (a pleasant surprise) and you could request a glass with ice to pour your drink in if you like. Finally, when you are ready to fly home from Mexico, have the ticket stub with you from your flight down so they can see that you paid 'tax.' Otherwise you will have to repay it at about $20+ dollars. The best photos of scenery from the train are east of Los Mochis or El Fuerte, which ever one you depart from, as you climb up to Posada Barrancas. 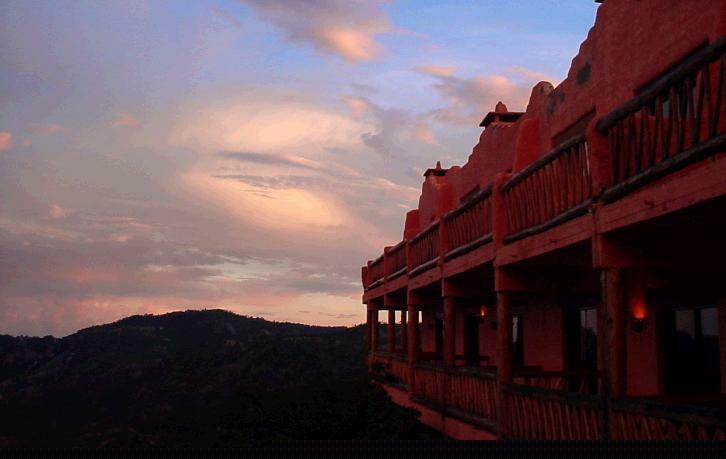 If you are staying at Copper Canyon, the best view from your room is at the Mirador Hotel which is situated right on the rim. Every room has a panoramic view, as well as the dining room and a large patio outside the lobby. You arrive about 2 p.m. the same day you leave which gives you an afternoon and evening to enjoy the canyon view. The next morning you get a new view as your east facing room lets you watch the sunrise...breathtaking!